Many of the reviews I've seen so far have complained about characters being generic archetypes, and I'd just like to mention that, that's the point. They clearly state that the reason these characters were "selected" was because they are completely different ends of the spectrum when it comes to personalities, and since they are all completely different extremes that wouldn't have gotten along otherwise, evolve from their interactions. Of course there's always the strong possibility that they don't at on this opportunity to make the characters more interesting, but there is still hope for salvation. Aside from all that, the animation and art direction is beautiful, and the music is wonderful to say the least. If it isn't for you, that's totally fine, but don't write it off as bad right off the bat. The more Kiznaiver you watch, the more you get out of it. I didn't think much of Kill la Kill. I thought it was all action no plot, no character development and meh animation. So, when Crunchyroll started ultra hyping another Trigger show, I was 100% certain it was going to be more of the same. Wow was I wrong. This show dives in so deep. I am fully invested in these characters. I care about whats coming next. The plot device is super odd, sure. But this story flows really wonderfully.It has a lot of the crazy twists and jolts of Kill la Kill, a lot of those AND NOW WE WILL RANDOMLY GO DO THIS but it all fits into the world built by the authors and makes for a fun ride. The art is great. Especially the subtle motion of lip and eye that tell you so much about whats going on under the surface. If you loved Kill La Kill you will probably like this as well for the crazy plot jumps. Im to Episode 7 and you get some good action, but mostly you can feel that we are rolling towards, well, the actual point I suppose? There's some bigtime action to come methinks. If you are someone like me who wasn't that big a fan of that prior work, I would say this is even more for you.if Kill la Kill was popcorn, this is a full meal. 3 episodes in and still impressed by the art. The story is questionable so far, but definitely original. It's pretty fun watching conflicting personalities forced to work together. I'm honestly a tad biased here because I really like studio Trigger but they have been really hyping this up and so I expect big things. So far, so good! Full stars, excellent show, and getting better every episode. Trigger has made another masterpiece that does not try to make relate-able characters but rather characters who are their own person. It uses cliches for , multiple characters that throughout the series become more that that and become true individuals. I recommend watching this anime whenever you can. Despite the lackluster early reviews, this anime is developing quite nicely now that it's into its fifth episode. Early reviewers panned this title for its pretentious plot and unrelatable characters, but they didn't consider that the earliest episodes were only meant to set the story up for later episodes. While the plot is still rather murky, slowly unraveling secrets seems to be a recurring theme in this anime, so I wouldn't hold its seemingly pretentious plot up for scrutiny until much later in the series. The most likely outcome, without delving into spoilers, seems to be that we will find out why so much importance is placed on the connection between the characters toward the end of the series. Whether the series delves into tiresome philosophizing at all is anyone's guess, but drawing from Trigger's past work, it is more likely that the plot will be allowed to progress toward a natural ending and any philosophizing will be left to the viewer. As for the early unrelatability of the show's characters, marked development has been made when it comes to that department. The characters have progressed beyond the point of being strangers among themselves and with the viewers. While the characters did seem to have thick walls around them at the start that made them feel almost infallible within the confines of their boxed stereotypes, their humanity has started to shine through more vividly. However, if you came into the show with the understanding that it was based partly on the premise of individuals getting to know each other (as the pre-release material should have suggested), the accelerated familiarization and character progression shouldn't come as a surprise. Overall, this seems to be a promising anime. I'm giving it four stars until further notice, with an extra star added to compensate for the undeservedly harsh early reviews. With other reviews having come in now that the series is over (and overall, people seemed to like it), I can say with absolute certainty that this is a solid four-star anime. The hazy story gets pieced together with enough time to put more focus on the conclusion and make it much more satisfying, and the pretentiousness of the plot breaks down as the characters and their personalities evolve throughout the series. Ultimately, it becomes simply, and most importantly, a story about friendship and the bond the characters share. Kiznaiver isn't so unique and so special that it should be on everyone's must-watch list, but it certainly isn't a waste of time either - especially if what you're looking for is a story where character growth and development is the main subject of interest. Please note that most negative review on this anime were given after the first 2 episodes. Everything about this anime is spectacular and I hope to continue seeing great things come from it. I don't normally write reviews but I just had to for this one because when I see this anime receive anything but a 5 star rating I get slightly worked up. One of those "rare" animes. This anime has developed its character really well, despite each of their flaws and imperfections you cant help but love all of them. I do believe since all of it has been justified to the degree that you are able to feel their "pain". This is very rare in anime, typically at the beginning to the end there's this one character you root for, but here, you can't help but be intrigue and see how they all develop emotionally and mentally. Story-wise its quick and lack proper foundation, though its expected as its part of play to make you want more and that is exactly how I feel finishing each episode. Wanting more. I maybe bias but who doesn't love anime where it tackles, social experiments and test its characters mentality to the limit. If you're looking for anime to watch this season. 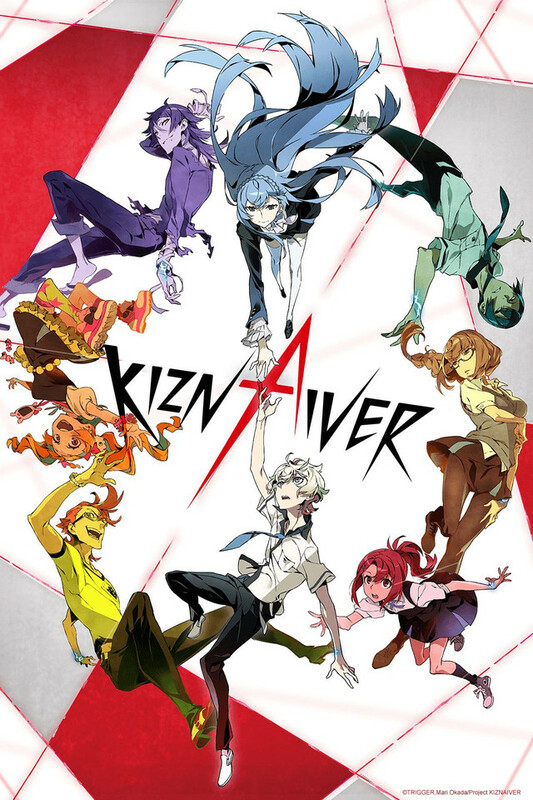 I recommend Kiznaiver, I guarantee you'll like it. "Do to others what you would want them to do to you." So goes the Golder Rule. What would happen if a group of people would be able to experience this quite literally? If all of them could feel the pain any one of them felt? Kiznaiver starts off with this quite original and thought-provoking premise - but along the way, it somehow ends up being more interested in seeing who will end up with who. I know, I know, we're talking about teenagers, and love is indeed quite an important aspect of their lives, made even more important by the whole emotion-sharing theme of the show. However, the really annoying thing about Kiznaiver is that it actually acknowledges the fact that its protagonists have a lot more to them than just their love lives, but then still manages to squarely ignore this revelation for the rest of the series. Similarly, it has the ability to create and develop complex characters, and yet many of the main cast remain painfully under-developed and two-dimensional. It even manages to present the same contradictory portrayal when it comes to character relationships: some characters have nice chemistry and their relationship develops pretty naturally, while others seem to be forced on the audience, seemingly "just because", or suddenly appear out of nowhere. I'd like to blame the pacing for these issues: it really baffles me that Trigger took their own original idea and made it look like a rushed, badly-paced manga/light novel adaptation. I really want to blame the pacing because if I don't, then I have only one other explanation: that Trigger, despite Kiznavier's awesome, unique premise, has actually been aiming at the lowest common denominator all along, like so many other anime. Let us hope that's not the case. first and foremost I want to give praise to the awesome OP this show has! most definitely wont ever skip it! !